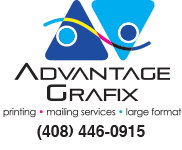 Welcome to Advantage Grafix Online! At Advantage Grafix , Cupertino, CA, where we love what we do. The passion we have for our work enables us to take ownership of our clients' projects. We constantly strive to deliver the highest-quality products with the least amount of stress and worry. There is no greater satisfaction than delivering a finished product that empowers a client reach their goals. We aim to make our clients STAND OUT and be noticed. To learn more about our approach to customer service, try our easy-to-use puldown menu and search engine or click on our Contact link to communicate with one of our customer service professionals. 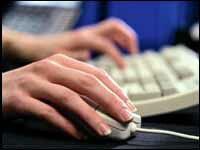 Our mission is to exceed client expectations by providing the highest-quality product possible in a timely manner. We create long-lasting, prosperous relationships with our client partners in order to help them reach their goals and objectives, sometimes beyond even what they thought was possible.